The 2019 Great South Run held on 7th April 2019 was dry and cool and excellent running conditions for the all runners. 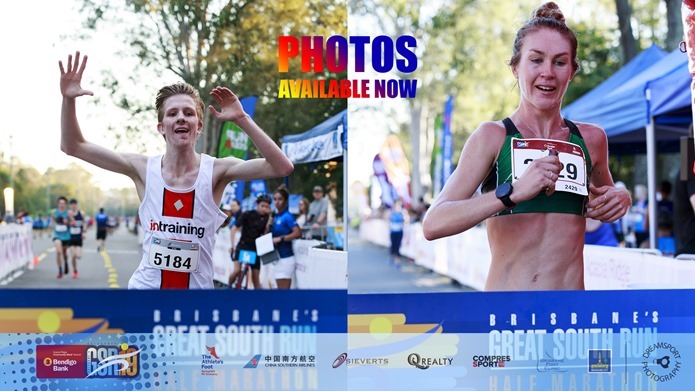 Brisbane's Great South Run is a super fast, flat, IAAF-AIMS certified half marathon on Sunday 8 April 2018 now in its 4th year and host of the 2018 Queensland Athletics State Half Marathon Championships. The event is an awesome morning road race run in very nearly flat out and back road laps on Paradise Road, Algester, Brisbane. There is an amazing race precinct right next to the road and a very cool village atmosphere, with lots of finished runners and supporters cheering on all the other runners still on course. A combined start of all three events 5km 10km and half marathon saw the elite runners get away at a great pace. Due to all events on course at the same time, even though we have numbered most of the photos we have actually grouped them into small galleries based on the time they were shot. This should especially help the 5km runners find their images it they had their bib on their back or covered. Of course the bib search system is the best way to find your photos! We know that many people want to purchase their high res edited photos without the sponsors advertising banner for a memory of the event. So we have made them all available to you for that as well. These are all numbered except where we couldn’t identify the bib number. We have some special deals for competitors in the Great South Run. Use our bib search system to locate your photos. Enter your bib number and search, or drill down into the event and specific galleries. You can also search for “nonumber” in case we have photos where your number wasn’t visible.